Blue Cat's Peak Meter Pro plugin will tell you everything about your audio levels. 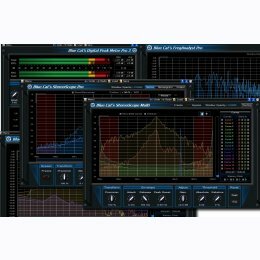 Blue Cat's FreqAnalyst Pro plugin and FreqAnalyst Multi plugin provide extremely smooth spectrum and frequency content analysis. Finally, the StereoScope plugin series let you visualize the stereo image of your audio content in details. These Pro plugins offer you unique possibilities to create your own signal-controlled effects and the 'Multi versions have unique multiple instances features to perform the analysis on several tracks or anywhere in a signal chain. Microsoft Windows XP, Vista or Windows 7. Mac OS X Leopard (10.5), Snow Leopard (10.6) or Lion (10.7).